I absolutely love reading these posts about what day to day life looks like for various moms -- work at home, stay at home, work outside of the home, etc. I am actually kind of bummed I never chronicled our day when Peanut was younger because, even though it was less than 18 months ago -- I have no memory of what we did all day! Serafina is now 18 months old, I am a stay at home mom and we live in Spain. Here we go! Trevor's work hours have shifted later since we moved here. It is fun to see him in the morning, but it also makes for very tough goodbyes since Serafina is obsessed with him. 7:05 -- Peanut is drinking her milk (since we have stopped nursing in the morning, she gets a cup of milk first thing) while I am being parent of the year and watching Olympics! I am obsessed with the Olympics and I am loving that the Spanish have no commercials and practically 24/7 coverage! In my defense, our girl takes forever to wake up so we usually cuddle on the couch anywhere from 5-30 minutes each morning, so she snuggled and slowly woke up while I got to enjoy some swimming early this morning. 7:30 -- girlfriend is finally awake and wants breakfast, she opts for a yogurt pouch while I have my usual cereal. She then plays throughout the kitchen and living room while I start laundry and get our stuff ready for the morning which includes making sure we have all of our stuff for swim lessons as well as a snack for before and after lesson. Serafina usually does really well playing by herself during this time which works great for me. We also spend time playing with pretty much everything we have in our living room/kitchen -- books, stuffed animals, our magnet board -- lots of animal sound making. Swim lessons are smack in the middle of lunch time (well, lunch time for us) so I encourage Serafina to eat a smaller breakfast on these days so that she is hungry for a big, filling snack before lessons. Usually she'll eat her yogurt pouch, a waffle and some of my cereal. 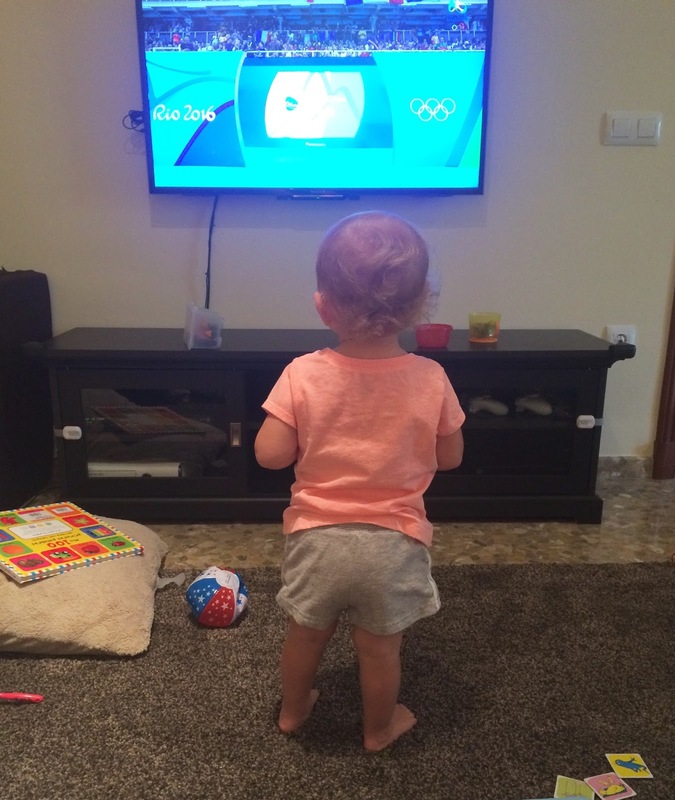 8:50 -- she's finally realized the TV was still on (oops #momfail) and begins cheering for the swimmers; I was so proud! I also realize we probably need to leave soon and that I should finish getting ready so I put on Puffin Rock (best show ever) so give me some time to run upstairs, get stuff into the car and all the last minute stuff I need to do to get us ready for the morning. Don't judge the TV watching -- I have learned the hard way that one show allows me to get things done and get us out of the house on time without any tears (from either of us)! 9:15 -- we are out of the door and on our way to music -- Serafina struggles a bit getting to the car because this morning she is very interested in our tomato plant. So I finally have to pick up a not too happy girl and put her in her car seat, but once she gets her book to read while in the car, she's much better. 9:30-10:15 -- the base's version of Kindermusik (it isn't technically Kindermusik but is very similar). Serafina absolutely loves music. She gets to sing, dance and run around like a crazy toddler all while learning to share, take turns, follow directions and put fun toys away. It is a great activity for us to get out of the house and meet other toddlers/moms. We didn't do music in July (not enough kiddos for the class) and I hadn't realized how much we both missed it until class started again last week. 10:15 -- we don't really have enough time to go home between music and lessons so we hang out on base (I mean we do have time, but it's just better if we don't). I run a quick errand at the commissary while Serafina does great in the cart, eating her sunbutter and jelly sandwich and some apples and some graham crackers... We then head to the pool for our swim lessons. I am not even sure where to begin with explaining the Spanish swim lessons so bare with me here. First, you aren't allowed to wear street shoes of any kind into the pool area. People literally stop at the locker room doors to change into their pool shoes. They have a wonderfully large family changing room with lockers, individual showers, individual changing rooms with changing pads in each room, high chairs to set your baby in while you get dressed or shower -- genius! We actually use the women's locker room so that I can change as well (the family locker room is co-ed). And the women's locker room has individual showers and high chairs to use as well. 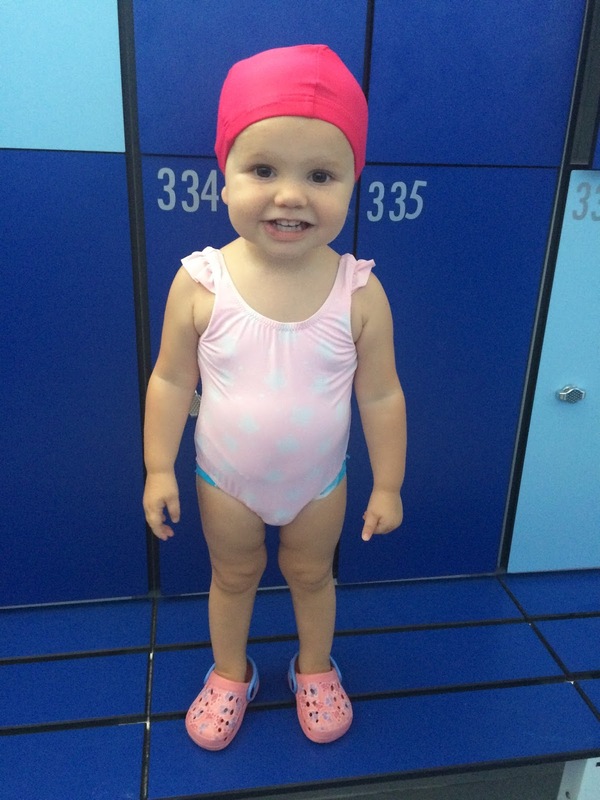 Everyone has to wear a swim cap, except the kiddos with little to no hair, like Serafina -- but they all have to wear caps when they turn two no matter what, so I make Serafina wear a cap too (plus all the other kids wear one, so may as well try and fit in a little bit - ha). I think the shoes and the cap thing is to help keep the pool/pool area clean. The lessons themselves are.... intense. The Spanish take their sports very seriously and swimming is no exception. While they know the kids are young, everything we do has a strict purpose for water/swimming readiness. They have slides into the water and fun games we do, but is also constant work and drills -- our instructor even uses a whistle! It doesn't matter if your kid is crying, they are doing the drill. Today the kids literally "swam" underwater between their parent and the teacher! 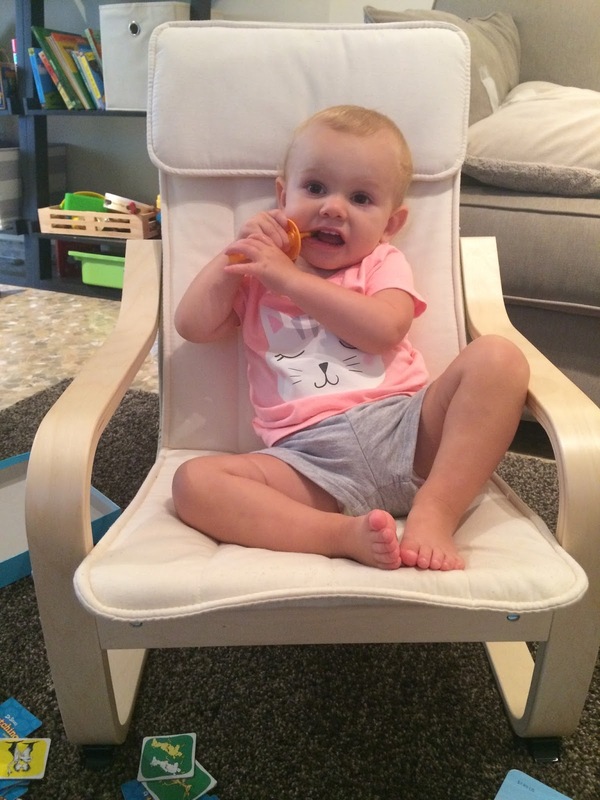 While this approach may not work for every kid, it is perfect for Serafina. And while she gets extremely mad when she can't do the slide the entire lesson, it is still good for her and we keep going! Everything is in Spanish so it takes a lot of brain power to figure out what is going on while also trying to keep your kid alive in the water. I am physically and mentally exhausted after lessons and often nap with Serafina on these days. 11:55 -- while lessons technically get over at 11:45, they seem to run late every day (yet they start right on time). We do the massive shower, get dressed, the car routine as fast as humanly possible. Serafina is starving and exhausted and is a real challenge in the locker room by this point. I have learned to bring snacks into the locker room (pretty sure it isn't allowed but oh well) to help the process along. And because I am only about one of three moms speaking English, we get a lot of stares! 12:45 -- we head upstairs to start our mini nap time routine (two books and snuggles). Serafina is a little restless and takes a while to settle down to finally fall asleep -- she isn't crying, just trying to get comfortable by snuggling all of her stuffed animals! 1:00 -- she finally falls asleep and I am resting on the couch, watching more Olympics and also researching Spanish daycares in our town -- I end up emailing two places for appointments to go visit. 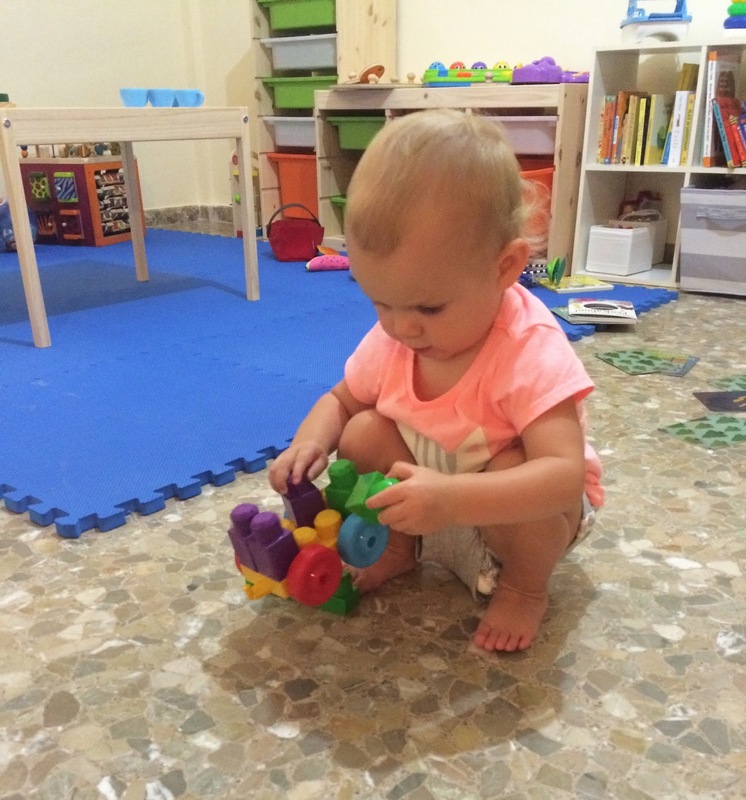 So just a quick note about Spanish daycare: it is technically daycare but is treated much more like school with uniforms and a set curriculum September to June, even for Serafina's age. 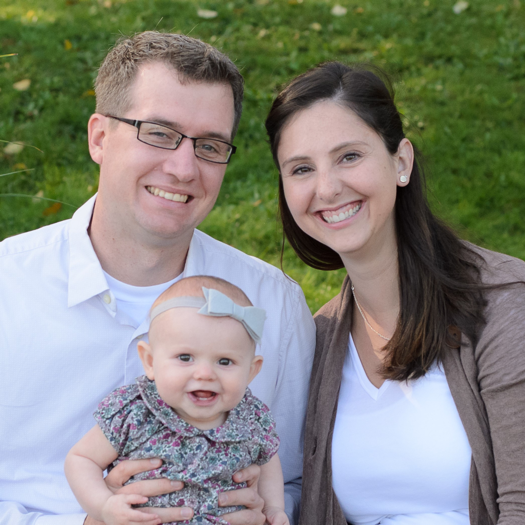 We plan on sending her a few mornings a week to help her start learning Spanish. 2:16 -- girlfriend is up and fussing and it is a good 15-30 minutes earlier than her usual wake up time... most likely from the annoying dog next door that is so loud I can hear it on her monitor. Ugh. I wait a few minutes to see if she'll go back to sleep which she won't so I go upstairs to get her. Typically if she's slept long enough, we head downstairs for milk and couch snuggles but because I know she is still tired, we hang out in her dark room snuggling in her rocking chair. She doesn't go back to sleep but at least she is still resting. 3:00 -- we end up heading down to the basement to play because it was super hot in our living room and kitchen. We had a lot of fun building blocks, reading more books, playing with ALL the toys and just hanging out. Because our Wednesday mornings are so busy, we usually hang out at home in the afternoon. If our mornings are slow and at home, then we typically try to do something in the afternoon -- go to the pool (the base pool has a great kids pool area), have a play date with friends... Something to get us out of the house! 3:54 -- I realize that we need to head to our local bakery for bread since we are having spaghetti for dinner and I want garlic bread! So I grab water, a snack for Serafina (these amazing bland Cheetos puff things) and my wallet. 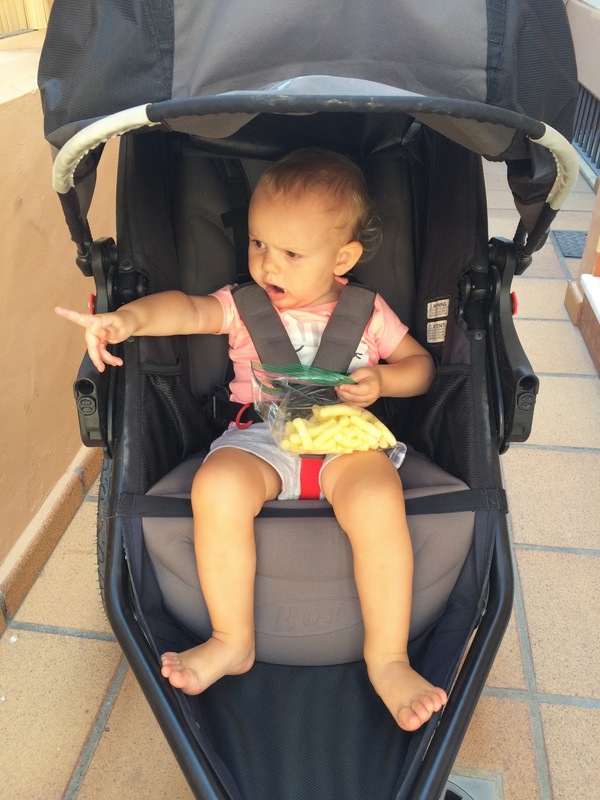 I throw Peanut into the stroller without shoes (a big no no in Spain, but whatever) and off we go. 4:05 -- we get our bread and have fun chatting on our walk (mostly pointing out all the dogs). I decide to go into the grocery store (best time to go because people are still home eating lunch and haven't ventured back out yet)! I manage to find two new things to try: these swirly ice cream pops with vanilla, chocolate, and whipped cream ice cream and this weird frozen coffee dessert thing. 4:20 -- home, slowly start the dinner process while FaceTiming with my mom and entertaining the Peanut! 5:16 -- Trevor gets home (a little earlier than usual) and Serafina is SO excited to see her "Dadda" (never said above a whisper). He and Serafina play while I get serious about dinner making. 6:00ish -- we all eat dinner together and tonight dinner happens to be a hit! Serafina eats all of her spaghetti and some of ours while managing to keep most of it off the floor and out of her hair (YES!). 6:30 -- no bath tonight since we already showered at the pool today. Trevor and Serafina play while I clean up from dinner and do a few other things around the house -- fold laundry, start another load, put laundry away, pick up the basement, etc. I love hearing both Trevor and Serafina just howling with laughter as they are doing who knows what! Serafina always gets the hiccups when she laughs too much and tonight is no exception. 7:30 -- we head upstairs for bedtime routine -- nursing, brush teeth, books, snuggle, bed! Serafina is out the minute Trevor puts her down! 7:45 -- Trevor and I pick up the house as needed and then collapse on the couch to watch more Olympics. We chat about some future travel plans and how our days went... We both do a little research about places we want to visit next, but mostly just hang out watching the Olympics. 11:00 -- heading to bed way too late but the swimming sucked me in and I could not turn off the TV! The Spanish announcers are just so excited about everyone and every sport that it's contagious! Now, this seems like the most "perfect" day ever -- and overall, it was a great day, but I did not write about all the toddler fires I had to put out by distracting, redirection, snuggles, hugs, etc. Or the flop on the floor tantrums that occurred when I had to say no to various things -- like climbing the toilet or trying to stand on the back of the couch. Our amazingly sweet girl is doing all the normal toddler things of testing boundaries and exploring her world. She is learning each and everyday and I feel so blessed that I get to witness that -- today she learned how to count in Spanish (thanks to our swimming lessons). So there is our day -- we do a lot of activities to get us out of the house, but also try to balance that with at home time, especially during nap time. Serafina also goes to the daycare on base two mornings a week so I can get some gym time and run errands (sadly, most stores here (both on base and in town) aren't really toddler friendly so it just works out better for everyone if I can go without our Peanut). LOVE this post. With your wonderful descriptions, I can visualize your whole wonderful day. Love and miss you all so much!